It was during his [Bill Devon] brief time in office that the city was gasping for breath. The closing of Crucible Steel in 1982 and the decline of the pottery industry had taken its toll on the local economy. 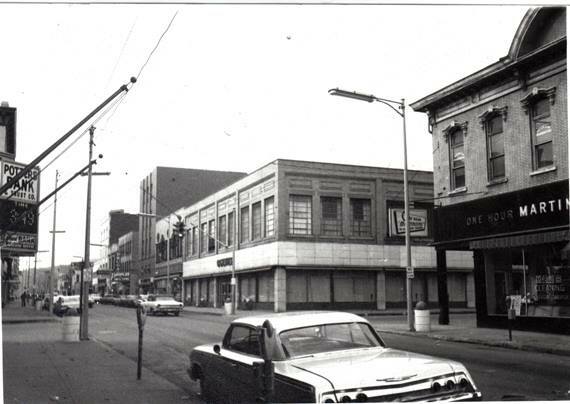 The emergence of Calcutta as a shoppers' haven was enhanced by the movement of Ogilvie's Department Store to Route 170 by its new owner, Frank Mangano. 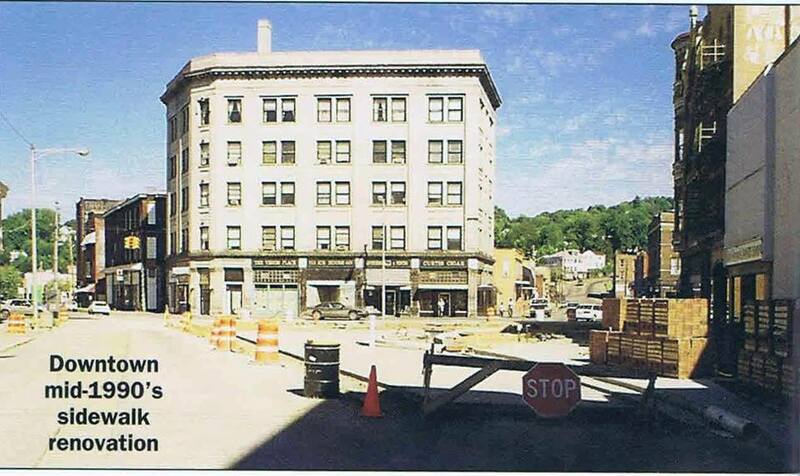 Mangano was deeply involved with the development of the Calcutta area, after becoming discouraged in trying to upgrade several downtown properties he owned, including radio station WOHI and a cluster of buildings on the Diamond. Frank J. Mangano was born July 15, 1934, in Newell, W.Va., where his family owned a modest automobile dealership. While his brother, Basil, continued selling Chrysler products, Frank went off on his own. 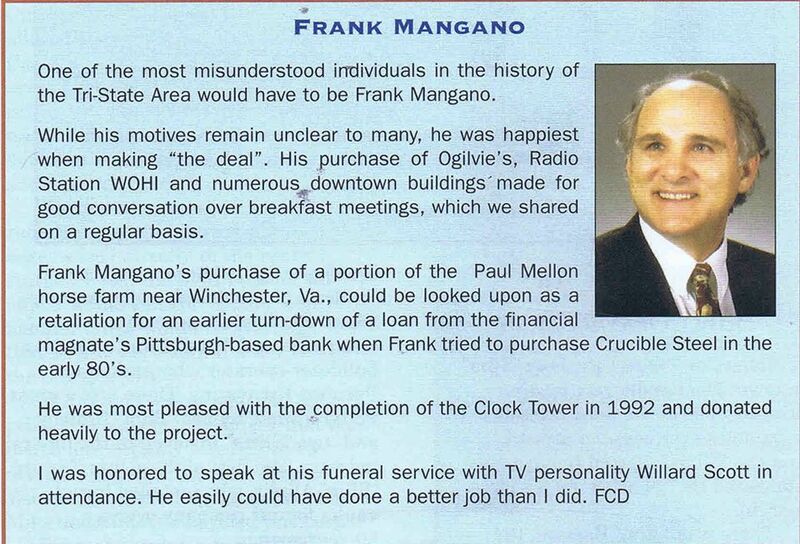 Although he held a degree in business and finance from Fairmont State University, Frank Mangano was a natural salesman and hustler. His first major breakthrough occurred when he bought a failing chemical plant south of Newell at public auction. He quickly converted the facility into a cash cow, and under the name, South West Chemicals, transformed his initial investment into an enviable return venue. He invested heavily into the stock market, and when he died on June 22, 1994, he left a very lucrative estate. To the benefit of the community, his holdings and family foundation assisted with development of the East Liverpool High School all- weather track and Beaver Local School's recreational building, as well a a host of other projects. The exodus of the Mangano interests had a devastating effect on the central business district. 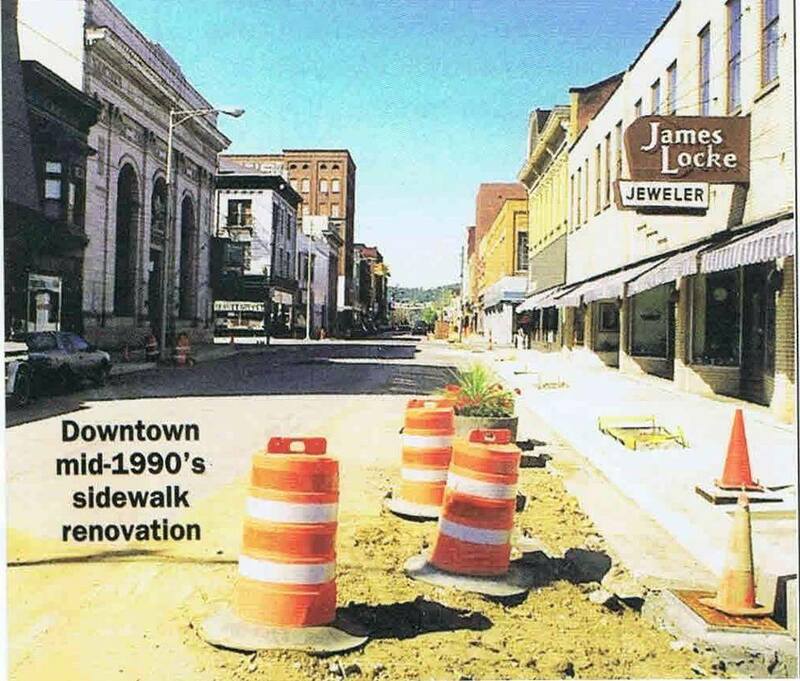 An effort to revamp the downtown with upscale streetscapes and new lighting was undertaken under the leadership of Dr. Marc Hoffrishter a former dentist turned financial advisor. Mayor Devon, and a group of civic leaders, got behind the plan, which many saw as a last- ditch effort. Unfortunately, while the money spent produced handsome results, it was too little, too late. Picking Elderberries “A Small Town Story” Frank “Digger” Dawson. Through dentistry, Marc [Hoffrichter] became associated with other professionals with whom he shared an interest in the ventures of Wall Street, leading him into a career as an investment counselor. It was, however; the inspiration of his grandmother, Fannie Davis Hoffrichter, a long-time downtown merchant, that caused him to throw himself head first into community development. 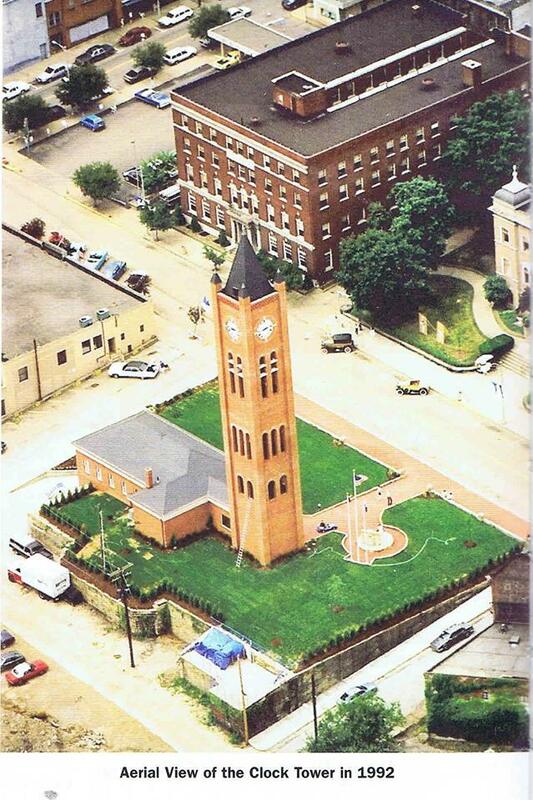 In 1992, when the East Liverpool Alumni Association dedicated the 136- foot high clock tower on East Fourth Street, Marc's mind was churning. He came to recognize that there was much more to be done, if the town were to survive the loss of industry, jobs and other opportunities for young people. In the previous year; retired Revieweditor Glenn Waight had invited Marc to his home where he outlined a plan to link city government, private business and school resources (in Waight's words), "into a focused community revitalization." Marc HofI'richter immediately saw the value of enlisting all three power blocs and began thinking out his own role and strategy. The first meeting of the movement, tagged "Task Force Fawcett" by Waight in honor of the town founder, Thomas Fawcett, was held Nov. 5, 1991, at the Dawson Family Center. Present were Hoffrichter, Mike Parkes, then president of the Chamber of Commerce, School Superintendent Tom Ash, Waight and myself. Later in the year, Mayor James Scafide, and then President of City Council Sarah Wilson became involved, and Marc enlisted E.G.&G., a community development firm. 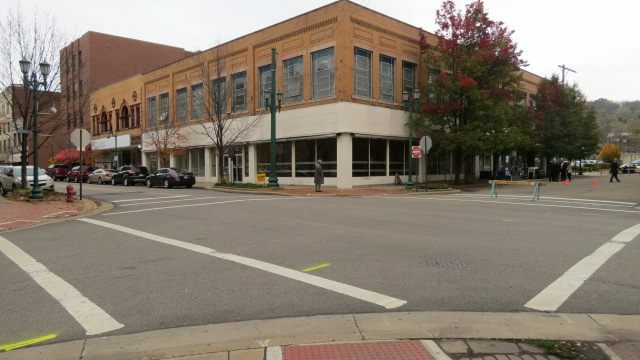 Several meetings were held with the Akron-based consulting company's president, John Grossman, until a plan was created to push for the renovation of downtown. Marc, virtually a one-man committee, led a massive campaign to win the approval of property owners for assessments as part of the financing for upgrading the central business district and attracting new industry. To this end, Victorian streetlights were installed, brick paving and sidewalks were laid with planters placed at intersections. 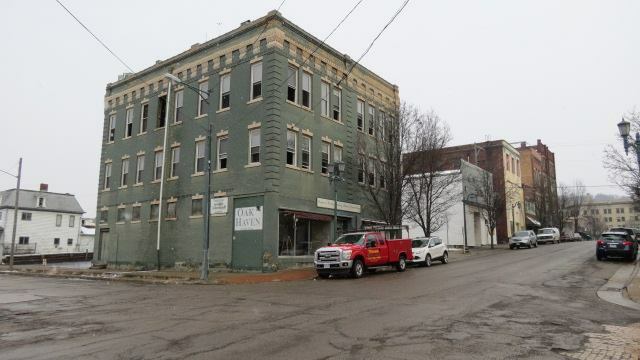 In addition to new sidewalks, gas and water lines were replaced and property owners received grants from the State of Ohio to upgrade their building facades. Marc's personal initiative convinced Sky Bank to acquire the former J.C. Penney building on East Fifth Street for a central data processing site as part of their spreading network of branch offices. At the urging of his wife, Cindy, a member of the Board of the local Salvation Army, he chaired a capital campaign for the organization, which resulted in building upgrades and expansion. Unfortunately, Task Force Fawcett fell on hard times with the death of Devon, the illness of Waight and the departure of Ash, while several business operations never recovered from the sales losses they endured during the renovation period. As the city faced a new century, a host of downtown locations had closed or relocated, including Kidding's Auto Supply, Crook Furniture, the Fifth and Fourth Street Antique Shops, Oak Haven, Dwyco Office Supply, the Subway Sandwich Shop, Pattison Jewelers and, sadly, a bankrupt Buckman Chevrolet/Buick dealership. I am pretty sure this was done during the "Task Force Fawcett" time period. Bids are being accepted take down this entire block. To replace it with this. 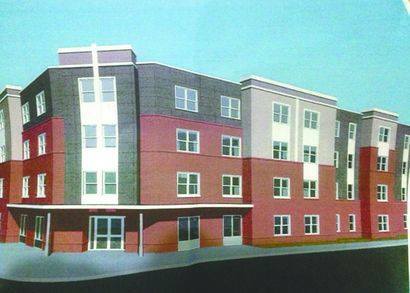 The Market Street Loft project, which entails a 45-unit workforce housing complex at the corner of West Fifth and Market streets. 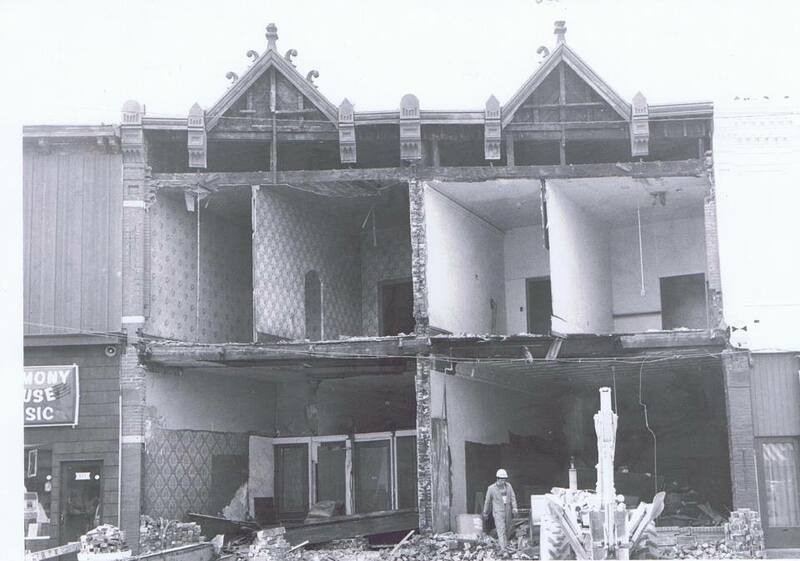 Also the former Ogilive's Department Store Along with the former Woolworth's 5&10 next door are being totally remolded, Woolworth's rebuilt, to become parry of the New Castle School of Trades international schools. I put this together to verify one common belief and to prove some another, or some others incorrect. The belief that powers to be in East Liverpool worked to keep other businesses out is true. That did happen at times. The belief that is why ELO is how it is today is false. It was a contributing factor especially in the early 1900's but it being the only reason the city is where it is today is false. New undertakings are in the works. 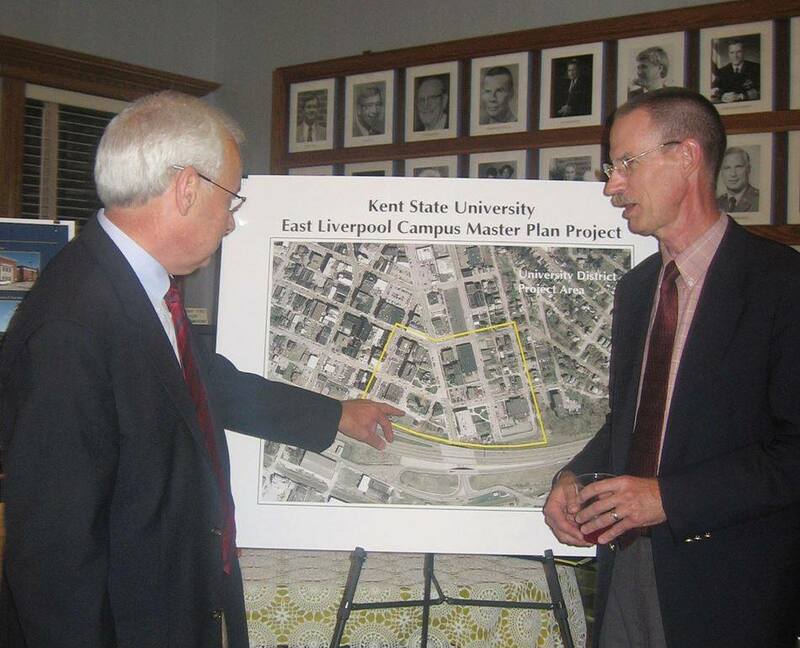 Hopefully they will be successful where similar ones in the past weren't A suggestion> Get Tne local government involved along with Kent State, The EL BOE. and the school administration, the local Newspaper, City Hospital, and the citizens of EL. BY ALL MEANS , READ THE DISCOURSE AT THE BEGINNING OF THIS SERIES WRITTEN BY A MAN WHO HELPED GROW EL ONCE. WORK WITH THE TOWNSHIPS. I recall the games that were played between the city and the townships when I was growing up in the 40's and 50's, They still seem to played at times to no ones advantage. Clicking on either ot the following will take you from this Project.